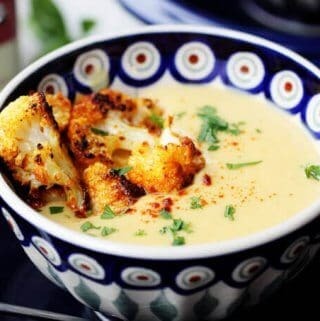 Roasted Cauliflower Soup with Smoked Paprika & Coconut Milk is a very flavorful and comforting soup. Spanish smoked paprika adds a little spice, while the coconut milk tempers it to create a perfect balance. This Roasted Cauliflower Soup with Smoked Paprika & Coconut Milk is my latest accidental creation. 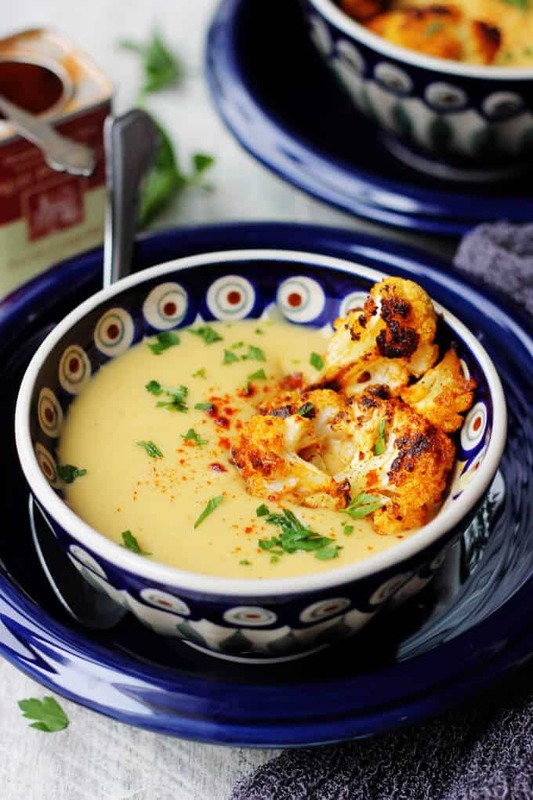 I wanted to make a smoked paprika roasted cauliflower soup….but with tahini. Recently I was shopping in my local Trader Joe’s and saw Tahini, but I didn’t buy it because I was sure that I had a whole jar in my pantry. 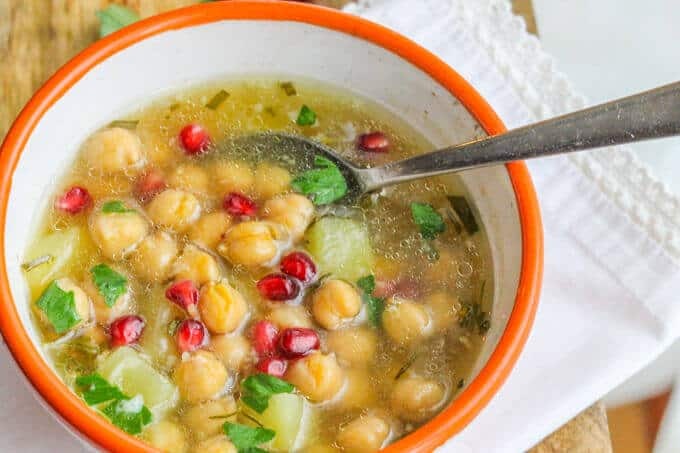 Anyhow, fast forward a few days and there I was starting to cook this Roasted Cauliflower Soup and in the middle of it I realized that for some unexplainable reason my tahini is gone!!! Clearly I didn’t remember when I finished it off. However, my mind has been playing tricks on me for the last several months. Mind you, I had a baby 7 months ago and my hormones are still a bit out of whack, which translates to forgetfulness and foggy head. My memory used to be very sharp, so this is kinda new for me. Well, I needed to gameplan on the fly, to find a solution that would work. That’s actually a pretty good example of how you can tweak recipes when you’re short of an ingredient but you have something else that can substitute it perfectly. 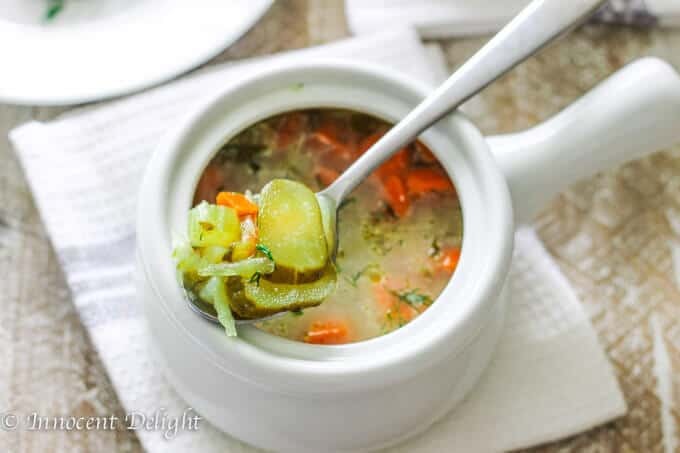 I had just bought this awesome organic full fat coconut milk and decided to use it with this soup. Oh my… let me tell you, this was such a good decision! Cauliflower is in season now, on the East Cost of United States. All the farms are sprouting it faster than can be consumed. I can’t stop myself. I love it so much that I buy it by compulsion. Check out my recent decadent, and not light at all, cauliflower creation: Cauliflower Pasta Bake with Brie and Fontina. It’s to die for. If you like a little more Asian flair, then try this Spicy Sriracha Cauliflower. Finally, roast till golden brown. Served with remaining roasted cauliflower and parsley on top. Voila! This is how we ate it on the first day. The next day though we were in a rush and I wanted us to eat something more substantial for lunch. I had some rye bread with caraway seeds, which I cut into little cubes and then toasted with a bit of olive oil. The crunch, with additional spices, was just epic. I couldn’t be happier with this. 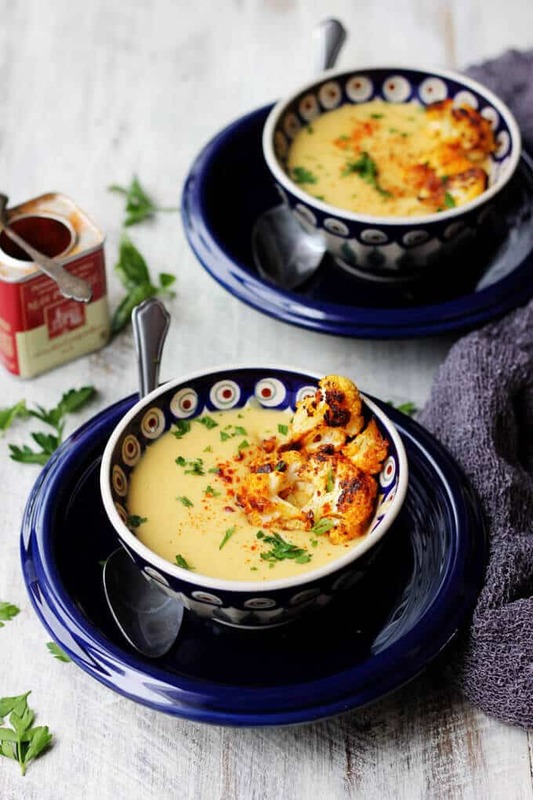 So, if you have some rye bread, make some croutons and add them to this amazing Roasted Cauliflower Soup with Smoked Paprika and Coconut Milk. It is really a perfect fall treat! 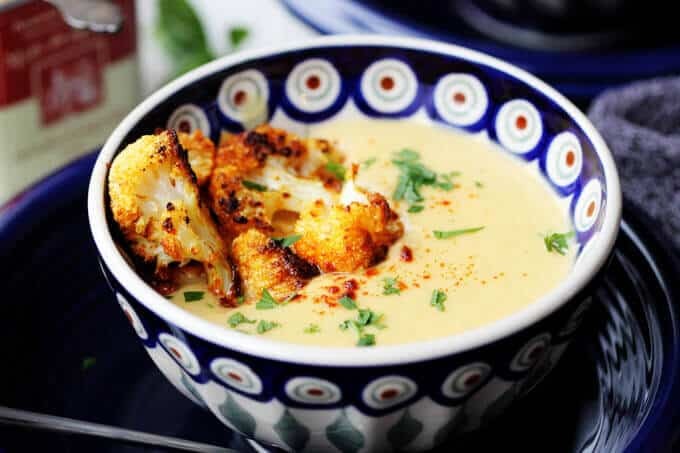 Roasted Cauliflower Soup with Smoked Paprika & Coconut Milk is a very flavorful and comforting soup. 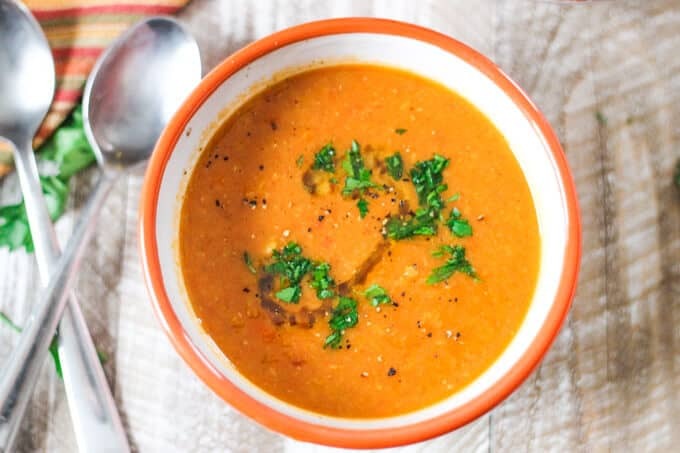 Spanish smoked paprika adds a little spice while coconut milk smooths it down to create a perfect balance. Serve it with remaining roasted cauliflower, sprinkle of hot smoked paprika and freshly chopped parsley. If you have rye bread with caraway seeds, use extra teaspoon of olive oil, add chopped bread and toast it on a pan for a couple of minutes until golden brown and top it on the soup. If you’re inclined to try this recipe, then please use the hashtag #innocentdelight on INSTAGRAM for a chance to be featured! Also, I encourage you to FOLLOW Innocent Delight on FACEBOOK | INSTAGRAM| PINTEREST | TWITTER for all the latest recipes and updates. Ok, this soup looks gorgeous and delicious and all – but Cauliflower, Fontina, and Brie Pasta Bake??? I’m dying! All the heart eye emojis! I like your accidental creations!! 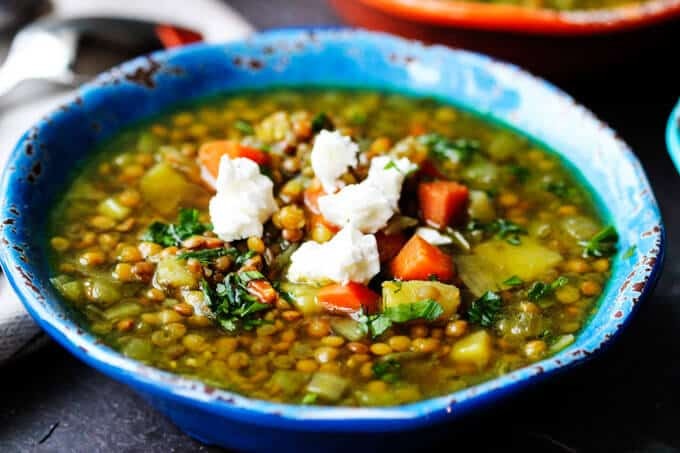 This looks wonderful, so full of flavour and just perfect for a chilly Autumn night! I am loving all the flavors you have going on in here. 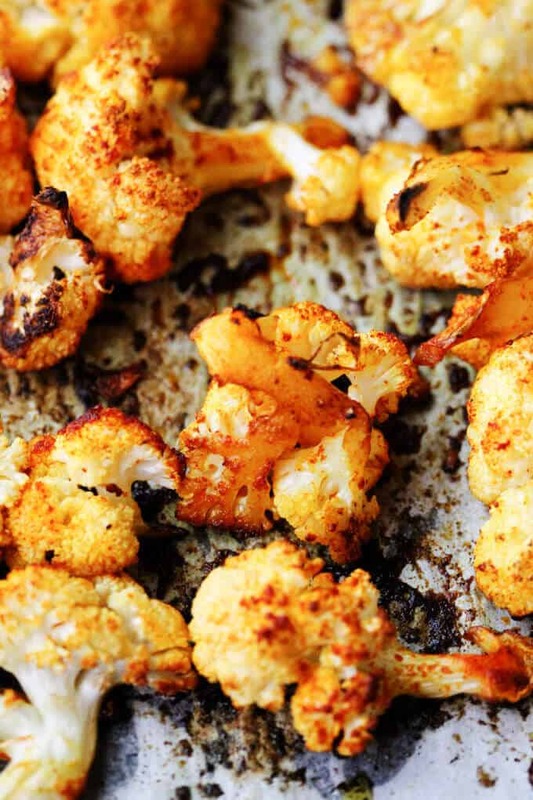 Cauliflower can be so bland but not with all that yummy cheese and spice! 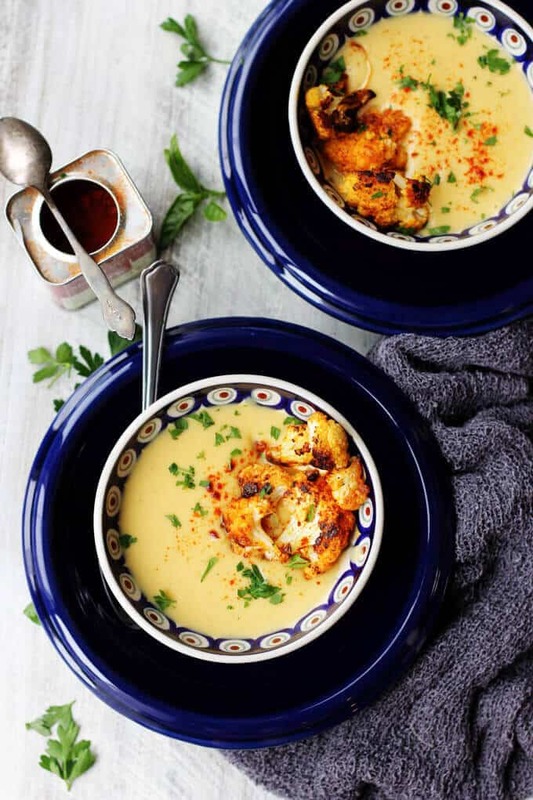 I have never tried roasted cauliflower in soup ! but definitely sounds delicious.I usually roast cauliflower with some ground turmeric and paprika and then have it with rice. I will definitely try this.